Gestur Stórsveitar Reykjavíkur að þessu sinni er bandaríski stórtrommarinn John Hollenbeck, en hann mun stjórna heilli dagskrá eigin verka auk þess að grípa í trommurnar. Hollenbeck hefur leikið með fjölda þekktra listamanna ss Bob Brookmeyer, Meredith Monk og Theo Blackman en er ekki síst þekktur sem frumlegur höfundur og leitandi listamaður. Hann er þekktastur fyrir hljómsveitir sínar Claudia Quintet og The John Hollenbeck Large Ensemble. Hann bætist í fríðan flokk gest Stórsveitar Reykjavikur í gegnum árin ss Maria Schneider, Bob Mintzer, Frank Foster og Bill Holman. Tónleikar Stórsveitarinnar fara fram í Silfurbergi föstudaginn 12.ágúst kl 21:20. 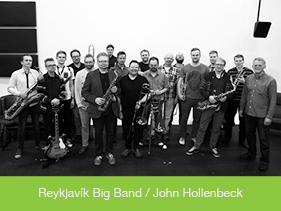 This year The Reykjavik Big Band invites as guest conductor and composer, master drummer John Hollenbeck. He will conduct a whole program of his own music and do some drumming as well. Hollenbeck has played with various well known artist through the years, such as Bob Brookmeyer, Meredith Monk and Theo Balckaman. In his own name he’s best known as original composer as well as an outstanding drummer. His ensembles, The Claudia Quintet and The John Hollenbeck Large Ensemble have enjoy great respect. Hollenbeck joins The Reykjavik Big Bands impressive list of guests through the years which includes amongst others Maria Schneider, Bob Mintzer, Frank Foster og Bill Holman. This concert takes place on August 12 in Silfurberg, Harpa 21:20.